MTB29er.com 29er Bikes 29er Bikes Are Better! To be blunt, 29ers are better bike than the 26er. Don't believe me? Just look at the number of 29er bike models offered by the bike manufacturers. 29ers have changed the mountain biking industry. Some say 29ers are not going to revolutionize mountain biking. The advantage of riding a 29er with bigger wheels at a lower pressure allows the tire to absorb small bumps and holes in the trail. 29ers are bigger but the weight gone can be negated with light weight wheels. Check the graph below from Singletracks.com. 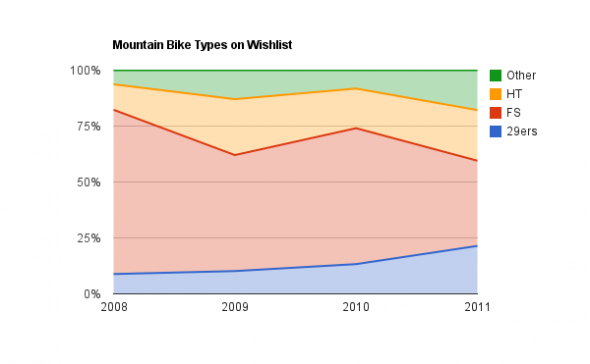 Clearly 29ers are trending up in a big way, with just 5% of singletracks members owning a 29er in 2008 vs. 25% in 2011.